Home→Dolls with Wispy, Painted Hair→Sewing by Hand or by Machine, which is faster? This may surprise you but, for me, sewing by hand is faster. Since the kids grew up and moved out, I’ve had a lovely sewing room with a sophisticated sewing machine. But, I rarely take the time to isolate myself and just sew at my machine for any length of time. Hand sewing can be done just about anywhere and any time, sitting in the living room in the evenings not watching my husband’s favorite shows, waiting for Supergirl’s school bus, while traveling by car or plane, in a hotel room, etc. I usually have several projects going at the same time and at least one of them is easily portable. So, since I can hand sew with more flexibility, I get more done. Here is an overview of three projects I am currently working on. 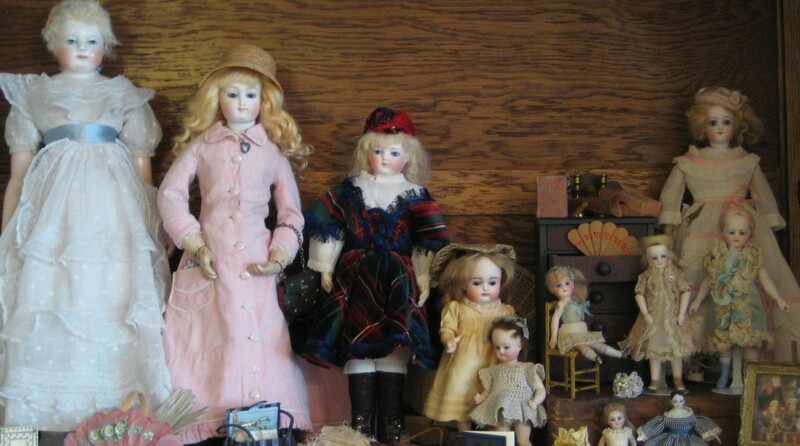 I will devote a future post to more detail on each doll, her costume, and what I put in a travel sewing bag. 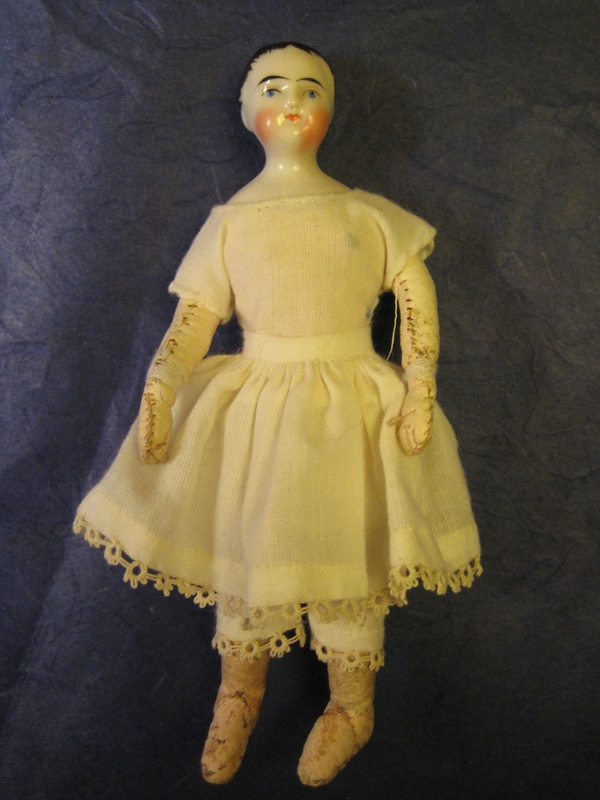 And finally, one of my “flip” dolls is a 6 3/4″ all bisque with painted eyes and wonderful shoes. Her “before” picture shows her rockin’ 80’s style, 1980’s that is. She has new undies and a slip, but her dress needs some lace and she needs a wig and hat. I have taken pictures of each step in her transformation and I’ll share them with you soon. I have been moving back and forth between these projects for a while. When I get stuck, or sometimes when I am afraid of the next step, I switch to one of the other projects for a bit. I’ll keep you posted on my progress. Which is faster for you, machine or hand sewing?